It’s been over a month since our last #DIYPS update. We haven’t made any significant changes in the system, and have been continuing to use it to successfully manage my BGs to (mostly) my satisfaction. That is, until this past weekend. 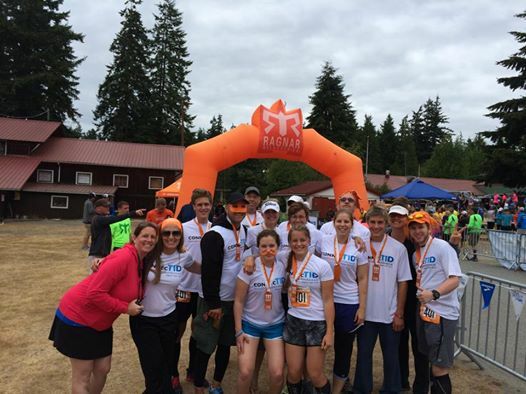 There was a team of 12 people with diabetes that got together (thanks @ConnecT1D and @IN_events for sponsoring!) to run “Ragnar Northwest Passage”, which is a 196 mile long relay race from near the Canadian border (Blaine, Washington) to Langley, Washington. 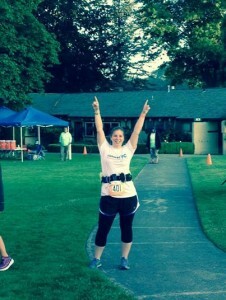 Guess who was lucky runner #1 and woke up at 3am on Friday to run 6.3 miles at 6:15 am? Here’s how the relay works: you have two vans, each with 6 runners, that take turns on the course. Each runner runs three different times, for a total of 13-19 miles. Van 1 starts and the 6 runners hand off to each other; then Van 2 meets up as the 6th runner finishes, and runners 7-12 commence running. Meet up again and handoff back to Van 1. (I’d say “rinse and repeat”, except for there weren’t always showers involved after every single run). The race started for our team on Friday at 6:15 am (see note about 3am wakeup and running first), and continued until Saturday at 4pm-ish. I slept ~4 hours on Thursday night before the 3am wake up and early race start. During the actual race, I got about 3.5 hours of sleep overnight in Van 1 while Van 2 was out on the course. 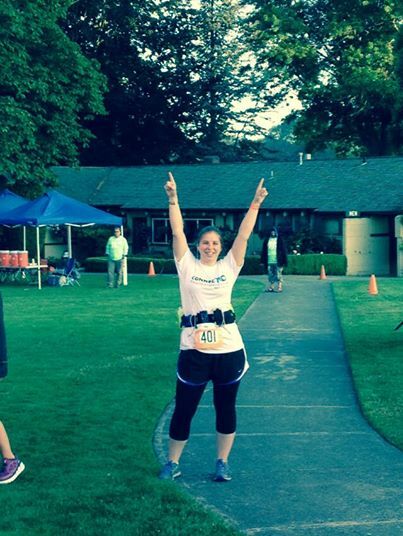 Normally I would have 16-20 hours of sleep under my belt for a half-marathon or longer race. I also didn’t have #DIYPS running at full capacity during the race – my Moto G phone has taken some hard knocks and the cord that connects to my CGM was wonky. So, I pretty much went “old school” and just used my CGMs as-is. However, once I finished the race and Scott and I headed out for dinner (real food! ), despite the usual #DIYPS prebolus strategies, my BGs rocketed up pretty fast. I chalked it up to something related to my liver absorbing or dumping glucose or whatever, didn’t worry about it too much, and focused more on getting 12 hours of sleep that night. (Luckily I was running higher and not lower, so sleeping through a few alarms was ok for the night). On Sunday, the same thing happened when I ate lunch. A few carbs and my BGs took off high. Same thing Sunday for dinner, and Monday after a breakfast that included carbs. 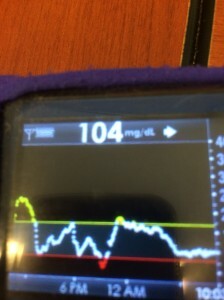 By Monday evening, I was puzzled and annoyed, because I had #DIYPS running but my body was not cooperating! I was also still feeling tired, above and beyond what Scott (who ran Ragnar on another team that had 12 members with functioning pancreases ) seemed to be feeling. Overnight, my BGs settled down and were flat after 6am and all morning, including after a breakfast with lots of carbs (I ate a gluten-free cookie, it was delicious). My BGs had a slight uptick..and flattened out. Like they used to do last week and all the weeks prior with #DIYPS. I took a picture to send to Scott, and had the sudden realization that my body had probably caught up on sleep to it’s minimum levels, and that’s probably why it was handling things like “normal” again*. #DIYPS is great at helping you deal with BGs if you don’t know the exact carb count in a meal, or dealing with the chaos of running more than a half marathon over three legs in a 36 hour time period on less than 8 hours of sleep. Like I mentioned before, it also helps me keep perspective – this time to help me let the few days of higher than normal post-race BGs go and not beat myself up about it. It’s probably a good idea to not try this kind of sleep deprivation at home (seriously – sleep is awesome, you should do as much of it as possible), and be aware that running Ragnar or another relay race** may throw off your BGs more so from lack of sleep than the actual exercise part. *Yes, it’s normal to eat a gluten-free cookie for breakfast! 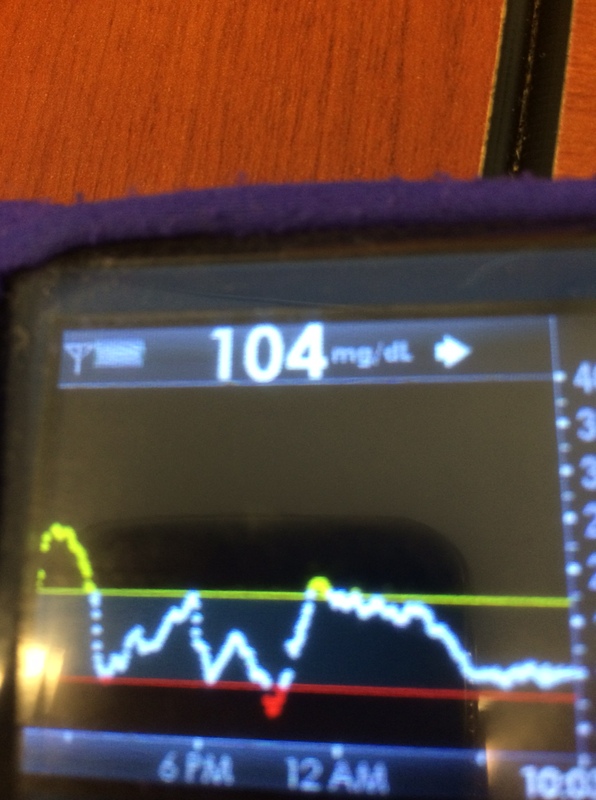 The non-normal part is having to do math and bolus and watch BGs. Having diabetes is not normal! 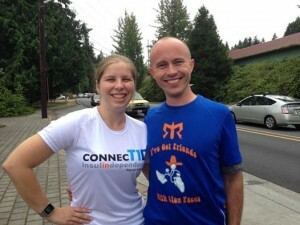 **Scott and I are running on a Hood to Coast team in August. Gulp. Maybe I’ll manage more sleep this time around in the vans?